Here is the very beginning. DO Listen to both episodes and new ones will following the new year. Please feel free to rate and review or pass it on to other people who might like this fun story. [00:55] Cuddle my pillow too. Do you? [01:06] you can. You can cuddle yourself if you want to. Mmmm Give yourself a cuddle now! Lovely. I do love cuddles, don’t you? Now if you're feeling cuddly, then...well...we can begin. Hurray! Hello. I'm Sarah. The teller of the Teddy Stories. I told these stories and others like him to my own children, and they liked them so much....I thought I would share them with you. Here we go! Cuddles Ahoy! 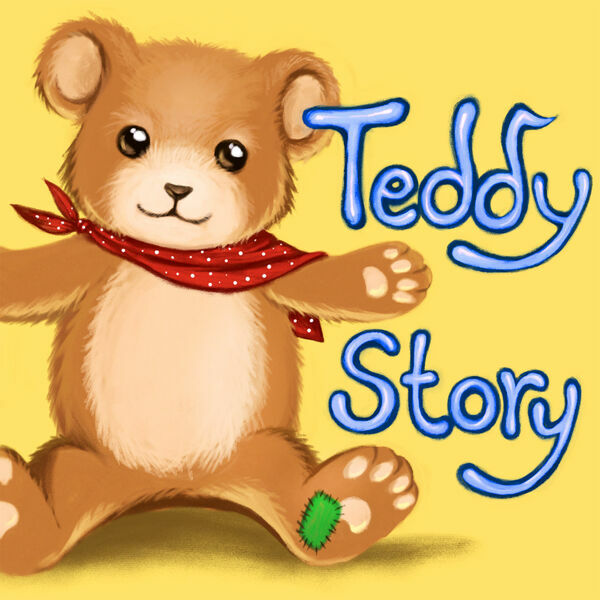 Teddy Story; The Prologue... Which means... The bit of story you need to know before even more fun begins. If you are good and kind to your teddy. If you give them a story and tuck them up nicely next to you in bed, maybe even let them have a little bit of your water -without spilling any onto your bed Of course! Then you might well inspire your teddy to become one of the magical chosen good...mmmm, one of the chosen few in this sometimes crazy, mad, mad, mad, mad, mad, mad world that seeks adventure, and quests, and goes out into the fun, fun, fun universes and wonderous dimensions of time and space, spreading your good nature and your love of nurture, nurture means, looking after things very nicely, making sure things are safe and well cared for. [02:35] And it also means sometimes giving nice cuddles to cheer up Teddy. Or even you. Because, well we all need cuddled sometimes. Don't we? Because. Well, you're very, very special. :0:56Cuddle my pillow too. Do you? Speaker 1:1:06you can. You can cuddle yourself if you want to. Mmmm Give yourself a cuddle now! Lovely. I do love cuddles, don’t you? Now if you're feeling cuddly, then...well...we can begin. Hurray! Hello. I'm Sarah. The teller of the Teddy Stories. I told these stories and others like him to my own children, and they liked them so much....I thought I would share them with you. Here we go! Cuddles Ahoy! Teddy Story; The Prologue... Which means... The bit of story you need to know before even more fun begins. If you are good and kind to your teddy. If you give them a story and tuck them up nicely next to you in bed, maybe even let them have a little bit of your water -without spilling any onto your bed Of course! Then you might well inspire your teddy to become one of the magical chosen good...mmmm, one of the chosen few in this sometimes crazy, mad, mad, mad, mad, mad, mad world that seeks adventure, and quests, and goes out into the fun, fun, fun universes and wonderous dimensions of time and space, spreading your good nature and your love of nurture, nurture means, looking after things very nicely, making sure things are safe and well cared for. Speaker 1:2:35And it also means sometimes giving nice cuddles to cheer up Teddy. Or even you. Because, well we all need cuddled sometimes. Don't we? Because. Well, you're very, very special. Speaker 1:2:50Oh yes, you are. But I digress. Which means I went a little bit off course from the story. Hmm. Uh, I do that sometimes. Brackets. Cool Emoji face . Close brackets. Now. If you look after your teddy Well, and all the things I've just said do apply to you about being kind and lovely to your ted. Did you have any idea that your happy, lovely little cuddly Teddy could actually be one of the most very special of teddies ever ever born that comes alive in the night and goes on magnificent adventures! Yes! Really! You see... At the dozy, bit in the night before you feel too asleep and not really very much awake. They wake up, they shake their head, brush that pours down over their face and smile a happy, happy smile. They look at you asleep, give you a little cuddle and a big teddy kiss of happiness, which probably makes you smile in your sleepiness and slowly get up and out of bed. Speaker 1:3:55They extricate, which means finds it hard to, but somehow gets out, extricate themselves from under your carefully tucked blanket sheet or duvet walk along the bed, sometimes having to jump over you or or fall and freeze in a floppy teddy pose as you roll onto your side to a more comfy sleeping position, possibly whilst you're snoring or dribbling a bit or pfthhrrrt maybe one of those. Once it's all safe to move again, teddy climbs down, off the bed, walks quietly across your sometimes messy floor. You know you really must help your parents tidy up you know. And touches the knobs of the wooden chest of drawers in your room. If you don't have a chest of drawers, then there will be magical places on the most north facing wall / now you can get someone cool to show you how to find north with a of compass or the position of the sun or something. Anyways, teddy finds the magical activation points in your room and gently touches those magical places in a specific, which in this case means the same important place and pattern in a specific order with their left paw. Do you know how to tell your left from your right? Speaker 1:5:08Okay. Touch your thumbs together, facing sideways at the tips in front of you, and point all your other fingers to the ceiling or the sky. Your left hand makes the letter ‘L’ for left. If you don't know what that looks like, get someone lovely to show you. I'm sure they can draw you a ‘L’ for words like lovely, love, like, Loo! Anyway, ‘L’ if you've put your thumbs together, hands to the sky, the one that makes the ‘L’ that’s your left hand. So the teddy in this story uses their left paw to light four knobs of the chest of drawers in their sleeping best friend's bedroom. Lucky knobs! Gently, slowly each silently lighting up in a glowing, sparkly yellow blue as teddy touches it. There is no sound, there’s only light and a happy vibe. This means feeling. Think of a time when you've been happy, like really, really excitedly happy. Speaker 1:6:11That's what happens when all of these knobs light up! Now, When all the four knobs have been pressed in order, and sometimes Teddy has to open up the bottom drawer and step on it to reach the tippy top knobs. But don’t you do this because you can fall down and bonk your head. Oh no! When all four knobs are lit and full of happy charged vibes and in a specific order, the most amazing and exciting thing happens. Can you guess what ? No? Oh go on guess go on ! No? Ok well I'll tell you. This opens a glisteningly, happy shining portal above it. Yes! So what’s a portal - oh what’s a portal you say ? Well, how to explain it? A portal. Mmm. Well, in simple terms, without all the science, it's a kind of magical doorway to another time and place. Speaker 1:7:07Yes! Exciting! Amazing! A door to anywhere! Now In this instance, the portal is a rainbow colored glowing oval of light, with yellow, bluey, glowing edges - yes, yes - like the knobs! You can make an oval shape yourself actually. If you go look in the mirror and say, a long ‘Ooh’, ‘Oh, Oh ohhhh’ - make your mouth long and tall, not just round, and can you believe that if you have a happy, magical, wonderful teddy, a portal appears above your chest of drawers / yes! Yes, The brighter and more colors there are, the more your teddy is loved by you. Heehee! Isn't that exciting? So what happens next? I hear you think. Well, teddy then walks back and clambers onto your bed, bounces on the bed three times, boink boink boink being careful not to jump on any part of you, of course, and uses the fourth bounds to jump up up up across the room and through the deep rainbow coloured, sparkly happy portal hole to adventure and yes, you’re rights - and beyond! And then the portal shuts up. Speaker 1:8:19Snaps tight - seals. Seals means closes in this instance, as well as being one of those lovely fun sea animals. Have you seen one in the water, or in the zoo? Aren’t words so amazing?! They mean so many things! Anyway, that portal seals until teddy needs to come back to get to cuddle with you. Sorry. What was that? What’s through the portal? Hnnhnnnn...so excited to tell you! On the other side of this sparkly happy portal is an entrance to a narrow but huge and long and twisting and winding beautifully bright yellow and silver and shiny like-a-mirror slide, which twists and turns and goes upside down and roundabout, backwards and forwards and inwards and outwards. It widens and thins and it goes sideways and diagonally, in wiggles and wobbles and jumps with glittering shimmering stars from space and time above, around and below it. Nebula and solar systems and synapses and building blocks of dark matter and all sorts of sciencey things our brains do not yet understand...all around, and as you slide this way and that, You can even move in time too, like a - a proper time traveller should - so sometimes you can even see yourself sliding in the future and the past, and even in the right-now-this-minute, thank-you-very-much. All at the same time, reflected on the edges of the silvery, sparkly slide, sliding up and down and roundabout, and well, having the most smiliest face of happiness that an excited and happy adventurers face can make. Give me a smile now, will you? Speaker 1:10:07Beautiful! (Make sure you brush your teeth!) So, now you know what your teddy can do, and where your teddy can go. Should we hear about the adventures of one of the loveliest boys that ever lived? His name was Lucas. His Teddy was born on the same day as him, and, was a light coloured brown with soft fur, sewn on eyes, nose and mouth and cute little red neckerchief with a little bell on it. Lucas loved this bear so, so much, and now he was five, really, really looked after teddy so, so well and filled them both full to the brim with happiness and lots of cuddly love everyday. Aw! Lucky Teddy, lucky Lucas! If Lucas was sad, he would tell Teddy why, and Teddy would look at him with his sewn- in happy eyes and make Lucas feel so much better with a cuddle. If Lucas was cross, because he had been sent to his room for being a ‘bit of a pickle’, as his mummy called him. He would tell Teddy, and somehow in his head, and using his brilliant imagination. He would Imagine Teddy telling him in Teddy kind of soft, calm and happy fun voice to ‘calm down, alright... Calm down’. And ‘think about what you've done’ and maybe in a minute ‘go and say sorry’ and ‘give people that needed a hug’ and ‘make sure we didn't behave like a pickle again for... At least half an hour... If possible.’ Lucas loved adventure books. He loved dragons and dinosaurs and bears and planes and trains and cars that talked, pirates and treasure! His curtains, had pirate's treasure ships at sea and he loved sea creatures and mythical beasts and...penguins and....biscuits. But he didn't much care for witches or wizards...much to his mummy's annoyance. He found them boring, which is a shame really... Because there were so many brilliant books about witches and wizards. So many, oh, Lucas’ mum hoped he’d grow out of this way of thinking, and read those books to herself, anyway! Back to Lucas tho. What Lucas didn't know, is that his teddy was one of the special ones. Yes, that's right. One that could open up a portal above Lucas’ big wooden chest of drawers, and jump through, and have different adventures every night. Every trip led to a different adventure, sometimes the same place and same friends, sometimes different places. And new friends. There was always a problem to help solve. Always someone in need of Teddy's nurturing. Oh!! Can you remember what that means? It means taking care of something and keeping it feeling safe -That's right! Teddy’s sole - that means only reason for going on adventures, was to share the love Lucas had given him and help solve problems in whichever land he ended up in. For yes! I didn't tell you that The Magic Mirrorred yellowy bottomed silver slide of happiness lead to a new adventure every night. That often in and around the happy land of Teddingtonville, Teddy landed at different times, dimensions and places in its’ existence, but! In and around it, all the same. You will understand if you listen on - On to chapter one! :13:26Chapter One - Lucas wakes up. Speaker 1:13:28Lucas woke up at 12:01 in the morning. What a crazy thing to do! How many minutes after midnight is that? Yes! One! 12:01 Was the magical time all the Magical Teddy's would wake up too. Lucas, opened his eyes a bit, and leant over to his bedside cabinet to get his water and have a sip, as it was such a hot July night After all. in his sleepy state, he didn't quite reach his bottle properly, and groping, blindly, knocked it to the floor, and heard an unexpected ‘ouch!’. What’s that! Who’s there? Whispered Lucas, Sitting up quickly. Sitting up quickly Now, trying to scan the room, and a little scared. It wasn't a voice he'd heard out loud, but it was familiar, Somehow. ‘Hello!’ He Managed, thinking he had imagined a voice. Oh, I'm sure you can guess who said ‘Ouch’ in such a soft, quiet manner. :16:20‘T- T Teddy! You’re alive!’ Lucas quickly swung his legs around and grab the bottle off his favorite teddy and set it aside. He felt hugely surprised he was speaking, but put it down to being overtired and over hot. Speaker 1:16:31WHats a? What’s a portal, Teddy? Lucas took a big swig of water as his mouth had gone all dry? ‘Ah, Well, rather than tell you. Let me show you’ Teddy said, and touches four of the eight round wooden knobs on the chest of drawers with the left paw. Remember how to find your left hand? Thumb tips together. Point your fingers to the sky, and your left hand makes a’L’. And well, My oh my! Lucas watched the sequence Teddy used, bottom left, top right, bottom right, top left, and kept watching as Teddy stood back and, from out of nowhere and above the chest of drawers, A Rainbow Centered Shimmering blue and yellowy edged oval hole appeared, and grew and grew quickly like - like watching someone put up an umbrella, a little bit of fiddling and boom! Full oval! Like the shape of Lucas's mouth as he said out loud. ‘Oh Wow.’ The portal was sparking and effervescent. This means like bubbling and and sparkling in an excited, bubbly, sparkly way - it was effervescent with all the colors of the rainbow and more moving and shimmering like Light does on the sea, ‘There’ said Teddy almost proudly. ‘That's a portal! YOUR one...ahhh your one is beautiful Lucas.’ ‘My one? Wow’ is all Lucas could manage. And a small fart too. So we've um - we’ve got 30 seconds. You coming?’ Teddy asked as he clumsily got onto the bed. ‘Now, I need three jumps and one more. Follow Me If you want to or go back to bed and this was all a dream. Follow me.’ He bounced Once ‘If you want ‘ he bounced two more times. ‘Adventuuuuuure...weeeeeeee’ He said as he bounced a final time, and was high enough to head towards and into the swirling portal. And swiftly, deftly, and with a gentle ‘plink’ sound disappeared into it. All of him. Gone. ‘Plink’. All content © 2019 Quirky Voices Presents.